Glue traps are a rodent control option on the market intended to trap mice and rats. When an animal steps on the trap it becomes stuck to the surface. As the animal attempts to free itself, it becomes completely enmeshed in the adhesive, eventually dying of suffocation, starvation or dehydration. Click for the story of patient #0925. Please note-- some images may be disturbing. Cruel: Trapped animals chew off limbs, starve, dehydrate, and suffocate while trying to escape from the glue. Non-target animals: These traps are indiscriminate; pet and wild birds alike are frequently killed by sticky traps, as are non-target mammals like chipmunks and baby opossums. 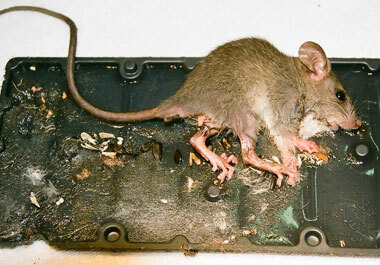 Human Exposure to Disease: Hantavirus (HPS) is a fatal respiratory disease passed through rodent droppings and urine. Animals caught in glue traps defecate and urinate on the sticky surface putting humans at an increased risk of contracting HPS. People frequently bring animals to WildCare that have been caught in glue traps -- both target and non-target animals. After witnessing first-hand the suffering caused by glue traps, WildCare is speaking out to educate the public about humane rodent control and alternatives to glue traps. The best method of rodent control is prevention. Rodents tend to set up camp in our homes when food and space are made available to them. Remove potential rodent homes like yard debris, trash, construction waste, etc. Eliminate food sources. Keep bulk food, seed, and dry pet food in metal cans with secure lids. Pick up fallen fruit. Take birdfeeders inside at night. Exclude rodents from your home. Seal openings 1/2 inch or larger around the outside of your house with metal, concrete, or Stuf-fit Copper Mesh Wool, which can be found online or at hardware stores. If you would like humane, professional assistance with rodent exclusion, contact WildCare's Wildlife Solutions service. Include natural rodent predators in your solution. A family of five owls can consume up to 3000 rodents in breeding season. Placing a nest box to encourage a family of owls to make your property home can be a great alternative to commercial pest control methods. Please visit www.hungryowl.org/ for more information. Use catch-and-release traps as a safe, sanitary, and humane solution. Catch-and-release traps will allow you to remove rodents from inside your home, but you must prevent their return by sealing entrance and exit holes and removing attractants (see above). If you are uncomfortable catching and releasing rodents on your own, or if you would like help sealing entrance points, contact Wildlife Solutions for assistance. If you exhaust all the above efforts and as a last resort decide to kill the rodents, please consider purchasing a rat zapper or snap traps. 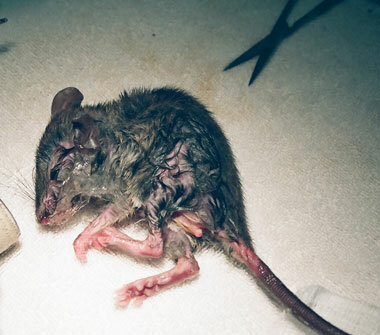 Our campaign is solely targeted to ending the sale and use of glue traps. We support and understand the need to control rodent problems. Below is a table detailing the pros and cons of rodent control options available on the market. Please note WildCare does not advocate the killing of any creatures, but we know that it is sometimes deemed necessary. If extermination is necessary, we want to offer people the least toxic and most humane options. Cruel: trapped animals chew off limbs, starve, dehydrate and suffocate while trying to escape. Non-target animals: These traps are indiscriminate; pet and wild birds alike are often killed by sticky traps. Young opossums, chipmunks, pet hamsters and gerbils are also frequent victims. Disease: Hantavirus (HPS) is a fatal respiratory disease passed through rodent droppings and urine. Animals caught in glue traps defecate and urinate on the sticky surface putting humans at an increased risk of contracting HPS. Toxic: Rodenticides can be lethal to pets, humans and wildlife. Non-target animals like owls are dying from eating poisoned rodents. Cruel: Those exposed to rodenticides die by internal hemorrhage, dehydration and organ paralysis which are very painful. Rat #0925 arrived at Wildcare on June 27, 2007 helplessly stuck to a glue trap. The homeowner had set the trap for this very purpose-- to catch a rat, but witnessing the cruel and painful suffering caused by the glue trap prompted this animal's rescue. 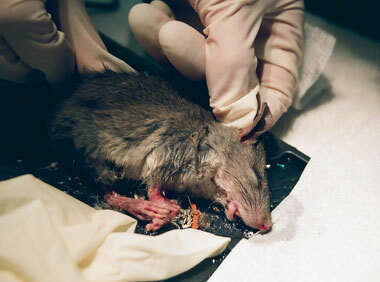 At WildCare, wildlife technicians put the rat under general anesthesia to relieve his pain and stress and prevent him from struggling and becoming further injured as they worked with an anti-stick solvent (the Elmer's stuff) to free him. After twenty minutes of teamwork rat #0925 was free from the trap and put on oxygen. The consequences of glue traps are devastating, rat #0925 had endured hours if not days stuck, frightened, starving and dehydrating. As he frantically tried to free himself, the trap pulled out his fur, leaving painfully raw patches of skin. Nonetheless he was lucky. Lucky, because his struggle was seen, where many glue trap victims are only viewed after suffering a long and drawn-out death. A person saw the cruel and drawn out death a glue trap causes, and brought rat #0925 to WildCare. Where he made a full recovery. Rat #0925’s rescue and rehabilitation at WildCare serves as an unfortunately rare, but inspiring occurrence. We are all compassionate people and as informed consumers we can end the sale and use of glue traps and ensure no more animals suffer needlessly.